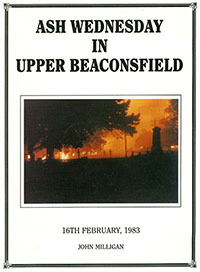 Upper Beaconsfield has experienced many disasters in its history. Most of them were acute events like bushfires, but the residents were also affected by heavy rainfall and flooding, which blocked access to the town and to the railway at Beaconsfield. Droughts and pests would lead to crop failure, and thus to economic hardship. This is the beginning of a collection of events that affected the residents of Upper Beaconsfield. Please get in touch if you have further information about any of these events.